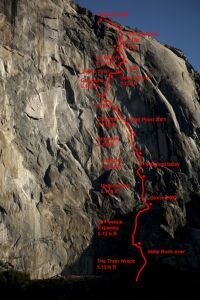 Just got a call from Pete - he witnessed a massive rockfall from high on Waterfall route on El Cap. They are safe (Ryan, Patrick and Pete) but think they can see bodies at the base. Pete said it looked like a sheet of rock about 100 feet square. Check in on any friends in that area. Hope no one is injured or worse. Edit: Apparently someone walked out of the debris. Hopefully others are just injured. Glad Pete & friends are OK! Whew! 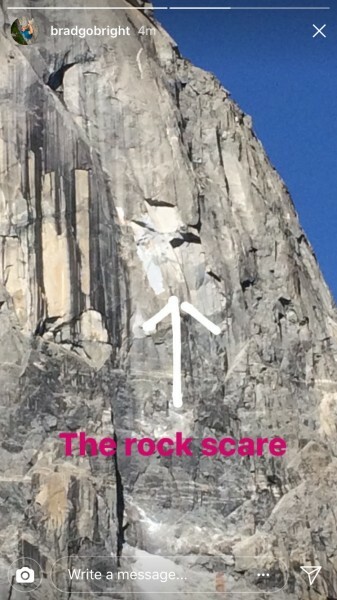 That part of el cap has seen a lot of rockfall over the years, but that is enormous. I hope the guys on the wall are are just seeing things other than bodies. Soooo hoping everyone is ok. :( :( :(. Brad Gobright posted a photo on his Instagram story. Brad Gobright posted a photo on his Instagram story. Looks huge. Let's hope there are no bodies below this. looks like some parts of the prophet might be gone as well. I always cringe when i see a large talus field and no glacier, comes from above every time. Hoping no one got seriously hurt. Fresno Bee has the same basic info as SFGate, CW. Lots of stuff on Facebook right now. I was supposed to climb this with Pete. Really f*#king scary sh#t right here guys. One report from FB says, "Massive rockfall on El Cap right now. Been going on and off for an hour now. Very active!" YOSEMITE NATIONAL PARK, Calif. — Officials at Yosemite National Park in California say a chunk of rock broke off El Capitan along one of the world’s most famously scaled routes at the height of climbing season. Ranger Scott Gediman said Wednesday that witnesses made multiple calls reporting the rock fall around 2 p.m. PDT. He estimates 30 or more climbers were on the wall at the time, but he could not confirm injuries or the size of the rock fall. Gediman says the park’s helicopter is helping assess the damage. The rock fall happened along the Waterfall route on El Capitan’s eastern buttress. Wow, that looks exponentially bigger than the one on the west face. Interested in hearing the details from gstock. Both of these happening during otherwise prime climbing conditions is scary. Take it easy. The thing about El Capitan is that all of the climbing routes to its top follow lines of molecular weakness. It's the basic rule of geology that troubles millions of people and the value we place on flat earth while surrounded by valleys. If you find yourself looking up at a route you want to climb, wait until the rain falls. You will see every weakness we climb, streaming water. Hey all, my name is Mark Evan Smith and I'm a reporter with the Sierra Star (newspaper in Oakhurst, very close to Yosemite National Park). We're happy that Ryan and friends are okay but obviously this is a very scary situation. Since I'm assuming it's difficult to get in touch with him, would it be okay to use his photo with full photo credit on our website, and then possibly for publication in The Fresno Bee, Modesto Bee, and elsewhere? I will be frank and let you know we did publish it with our story, but we can remove it ASAP if that's what Ryan would prefer. The Associated Press and several television news outlets also wish to use the photo. My phone number is (559) 683-4464 and email is msmith@sierrastar.com. Please let me know if this is okay. Thank you!